With a new year always comes a new goal to eat better but to eat well. Now if you’re not sure what I mean, let me explain. I usually get off track during the holidays but with the new years comes a new resolve to pay more attention to the meals and ingredients that I fuel by body with. However, it’s cold (and I do mean bone chillingly cold) where I live so I crave meals that warm me up from the inside out. With all this in mind, soup has become one of my go-to healthy meal ideas this January. It’s easy, it’s delicious and what I really love about soup is you can make it your own with so many easy additions and ways to serve it. While I enjoy pretty much any soup variety, right now I’m totally crushing on Butternut Squash soup (well, butternut squash everything but especially soup). While it’s great served in a bowl, I want to show you my favorite winter soup dish that delivers in flavor, in warmth and is crazy cute too! 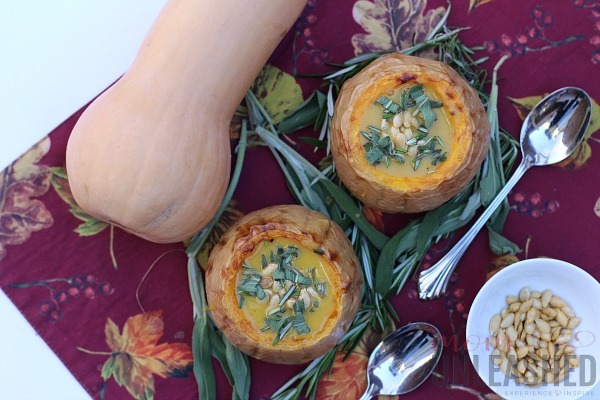 These Butternut Squash Soup Bowls are perfect for a family night in or when friends come over. Chances are that everyone of you out there has at some point eaten soup in a bread bowl. Since bread bowls aren’t really on my list of foods that I’m eating right now, I wanted to find an alternative options and man, did I ever! 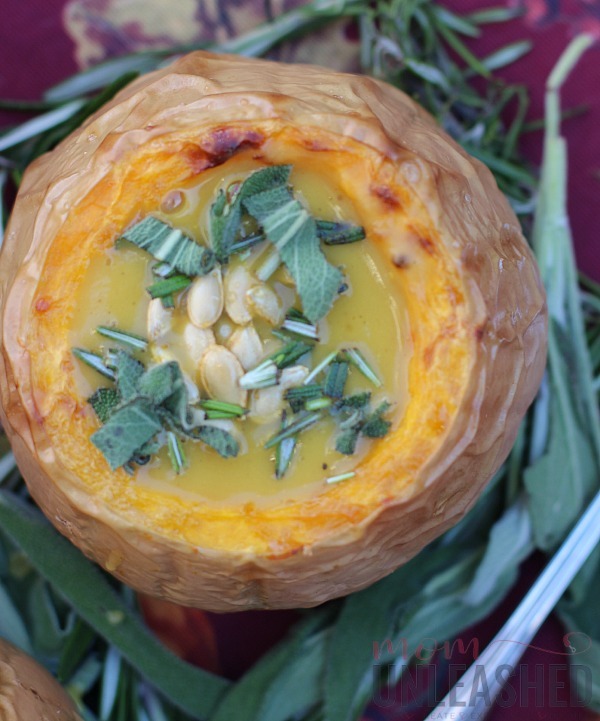 By serving up Imagine® Butternut Squash Creamy Soup from Walmart in…wait for it…butternut squash bowls with roasted butternut squash seeds and herbs on top, I was able to create a meal that’s satisfying while still being a perfect fit for my healthy living goals. But before we get to this recipe that you’re going to want to try NOW, let’s talk a little more about how I make this a quick and easy dish. Like I mentioned earlier, I love Butternut Squash soup. However, I haven’t been too successful in my attempts to make it. 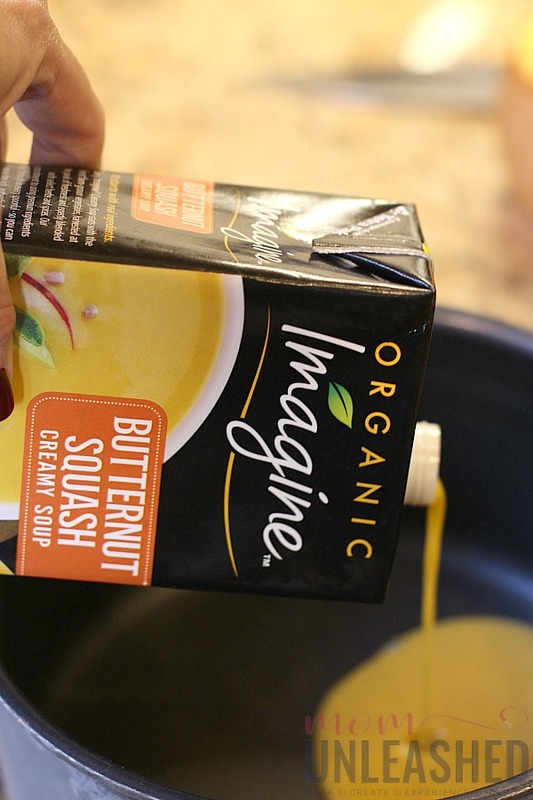 So, when I was recently shopping at Walmart, I stopped in my tracks with I saw Imagine® Butternut Squash Creamy Soup in the soup aisle. Along with it’s sister soups of Tomato and Potato Leek, the Imagine® Butternut Squash Creamy Soup immediately caught my attention. Not only is it the perfect size to feed a family our four (or even you and three of your best girlfriends! ), it is also organic and can be warmed and served quickly! After standing in the aisle drooling as I held the package in my hand, I quickly began to put back the ingredients I had picked up to make soup because I could instantly tell that this was a much easier and much more delicious option that fit right in with my healthy eating goals. However, just as I was about to put back my whole butternut squash, inspiration hit me! I decided that I could serve up the creamy taste of Imagine® Butternut Squash Creamy Soup inside a butternut squash bowl. I knew it would be visually stunning but I had no idea how quickly this would become my go-to healthy soup dish for the winter. After purchasing my ingredients from Walmart and taking them all home, I set to work whipping up this healthy meal that’s perfect for lunch or dinner (and hey, I won’t even judge if you eat it for breakfast!). 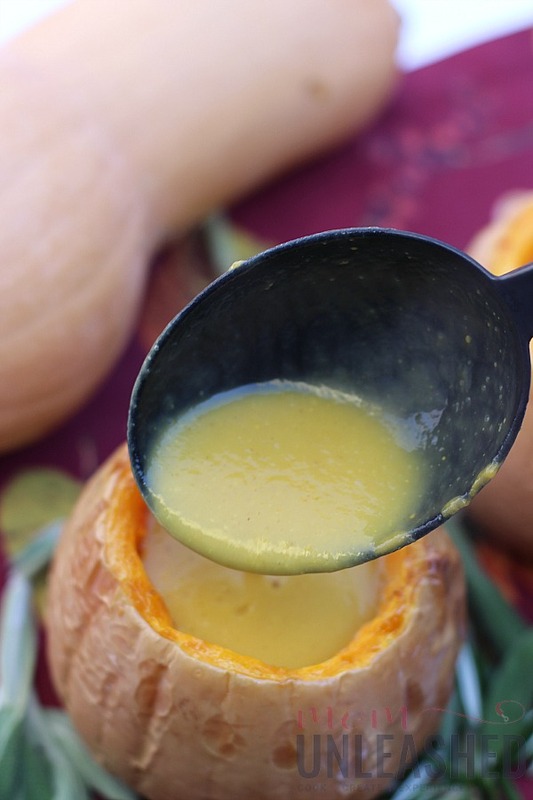 These Butternut Squash Soup Bowls serve up creamy and delicious Imagine® Butternut Squash Creamy Soup in baked butternut squash soup bowls for a meal that's satisfying and stunning. Cut the butternut squash in half, leaving the bowl shaped bottom portion intact. 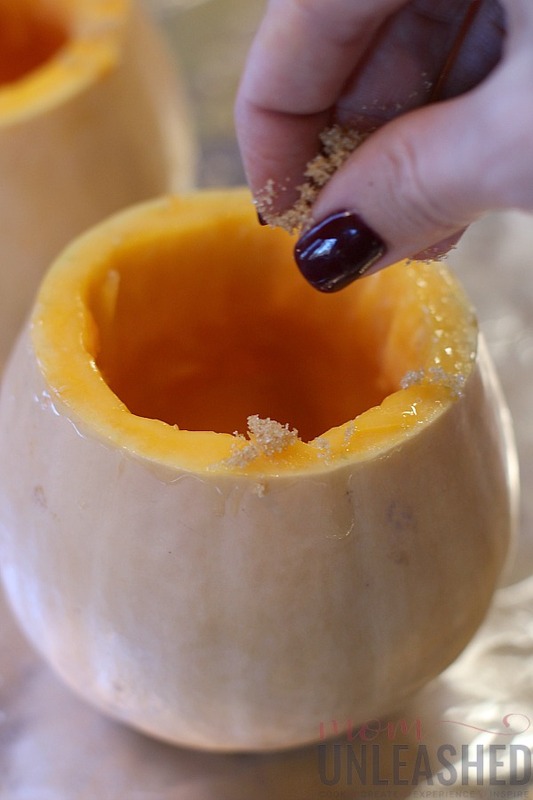 Scrape out all the seeds and filling to hollow out the bowl of the squash and set the seeds aside. 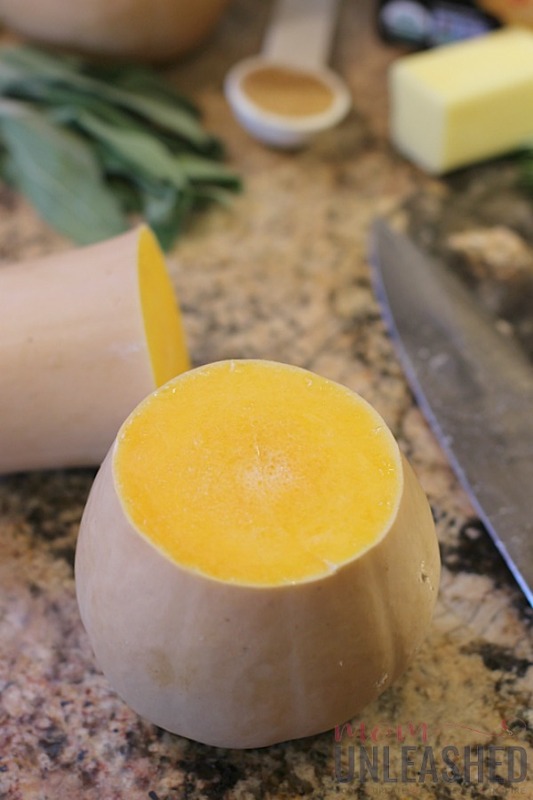 Once the butternut squash bowls are hollowed out, melt the butter and brush it on the inside. Sprinkle the brown sugar on the inside of each bowl and then bake open side up on 400 degrees for 45 minutes. When the buttternut squash bowls are brown and bubbly, remove them from the oven and turn the heat down to 275 degrees. 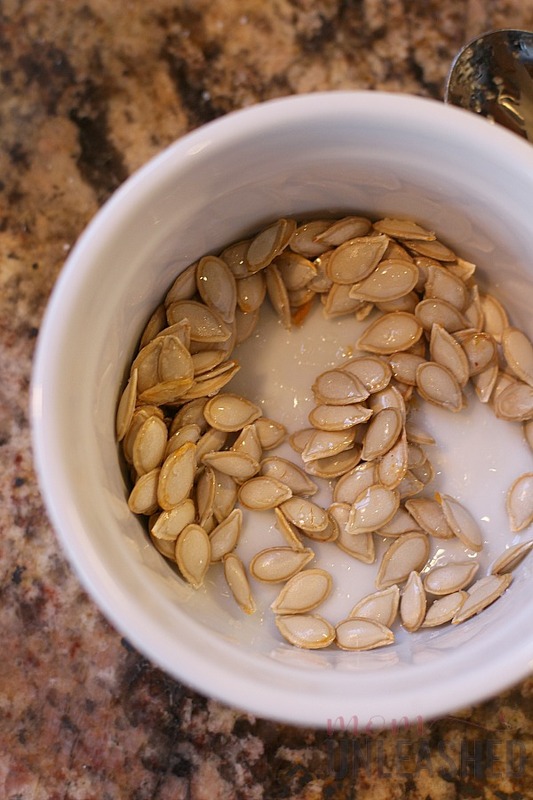 Clean and dry the butternut squash seeds and mix them with the olive oil and sea salt. Spread the seed on a baking sheet and bake for 15 minutes on 275 degrees. 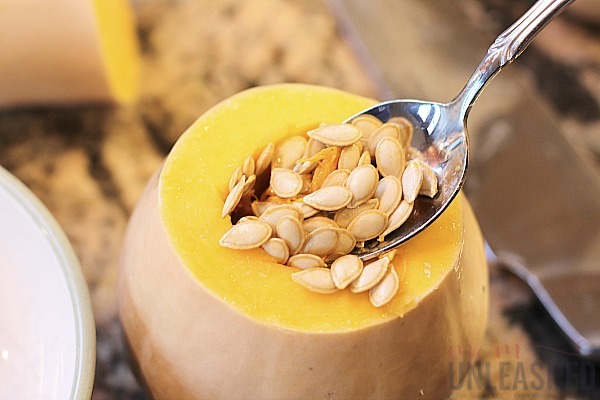 Once the seeds are crunchy, heat the Imagine® Butternut Squash Creamy Soup on the stove top until it is warm and bubbly. 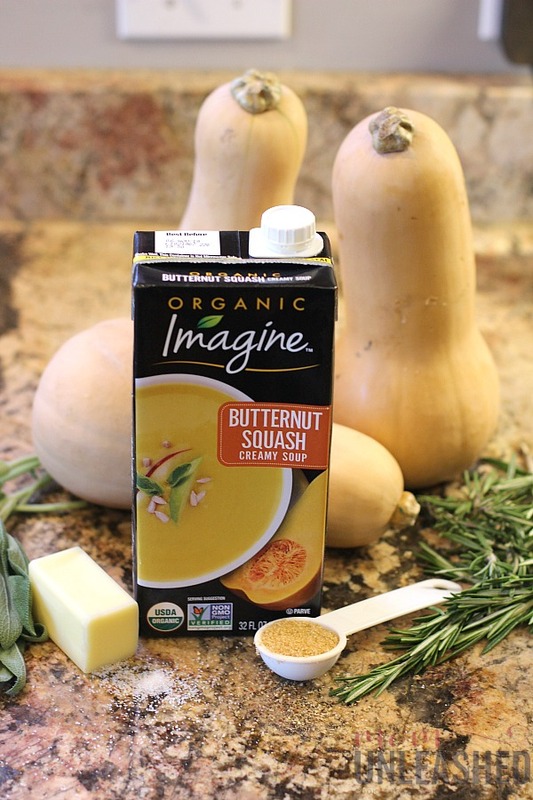 Once the Imagine® Butternut Squash Creamy Soup is ready, pour it into the butternut squash bowls. Garnish with the roasted butternut squash seeds, chopped sage and rosemary and serve immediately. I can’t stress enough how delicious these Butternut Squash Soup Bowls filled with Imagine® Butternut Squash Creamy Soup from Walmart are but in addition to being one of the best things you’ll put in your mouth this winter, they are also so dang cute! To start them, I cut my butternut squash in half, leaving the bowl part of the squash intact. Next, I used a spoon to hollow out the middle of each of my butternut squash soup bowls and set the filling and the seeds aside. Once I had hollowed out my bowls, I melted my butter and brushed it on the inside of each of the prepared butternut squash soup bowls. Then I simply sprinkled on my brown sugar and popped them into the oven on 400 degrees for 45 minutes. When the butternut squash soup bowls were ready, they were golden brown on top and the insides were soft. As soon as my butternut squash soup bowls came out of the oven, I lowered the heat to 275 degrees and separated my butternut squash seeds from the filling that I had pulled out of each bowl. After washing and drying my seeds, I mixed them with my olive oil and sea salt. I then spread them on a baking sheet and baked them on 275 degrees for 15 minutes until they were crunchy. With my butternut squash soup bowls and my roasted butternut squash seeds ready, all that was left to do was heat up my amazing Imagine® Butternut Squash Creamy Soup! 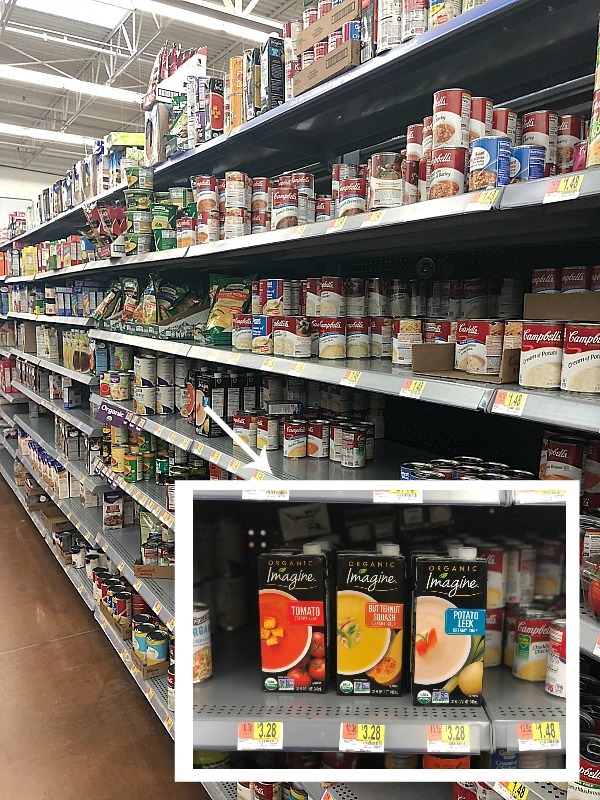 This wonderful soup that’s available in the soup aisle at Walmart is a nutritious option that tastes like it’s been baking all day and fits in perfectly with my new year’s goal of staying on track with my healthy eating. Even better, all I had to do to prepare it was twist open the top, pour it in a pan and heat it on the stove. 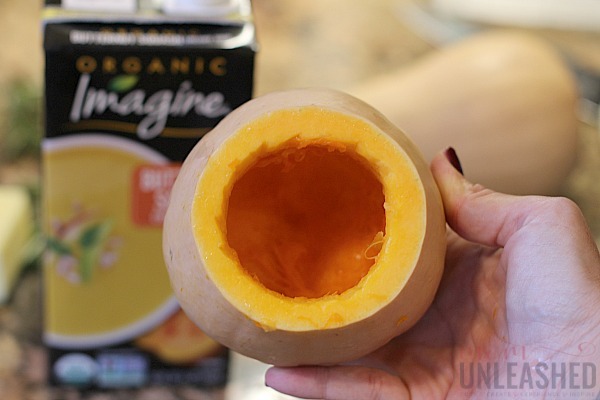 Once my Imagine® Butternut Squash Creamy Soup from Walmart was perfectly bubbly, I removed in from the stove and spooned it into my waiting butternut squash soup bowls. Immediately my mouth began watering over this beautiful and delicious dish but I wasn’t done yet! Remember those roasted butternut squash seeds I made earlier? 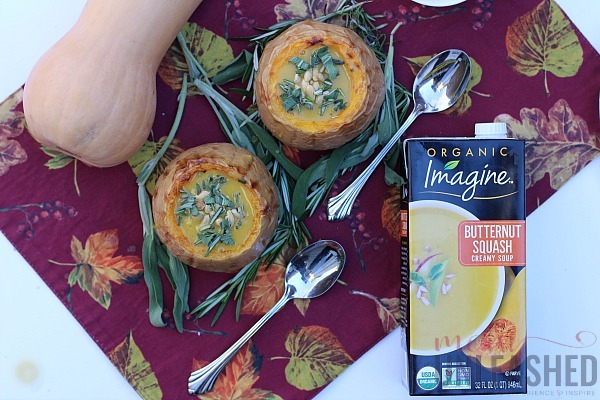 I sprinkled them on top of my Imagine® Butternut Squash Creamy Soup and finished it off by adding some chopped sage and rosemary. Just like that I had a hearty, warm dish that was bursting with flavor, was fancy enough to serve for any occasion and fit right in with my healthy eating goals. And do you want to know the best part? I had been able to find every ingredient to make this amazing meal at my local Walmart. As I sat back and savored the delicious tastes of my Imagine® Butternut Squash Creamy Soup served in my butternut squash soup bowl, my knowledge that eating healthy doesn’t have to be boring was reaffirmed. I mean, let’s face it, when you can eat like this and still stay on track with your healthy choices, who wouldn’t want to? Whether you’re looking for new recipes to help you stick to your healthy eating goals, looking for a great way to warm up this winter or want a soup dish that’s sure to wow, I highly recommend you try these butternut squash soup bowls filled with Imagine® Butternut Squash Creamy Soup from Walmart. To get you started, look for the Shopkick rewards while the offer lasts. Not only can you look for savings on specially marked packages and save up to $7 but you can also save $2 when you buy two different brands from the following choices, Rice Dream® Beverages, Imagine® Soups and Broths, Greek Gods® Yogurt. To find out more about this great offer, be sure to click here. 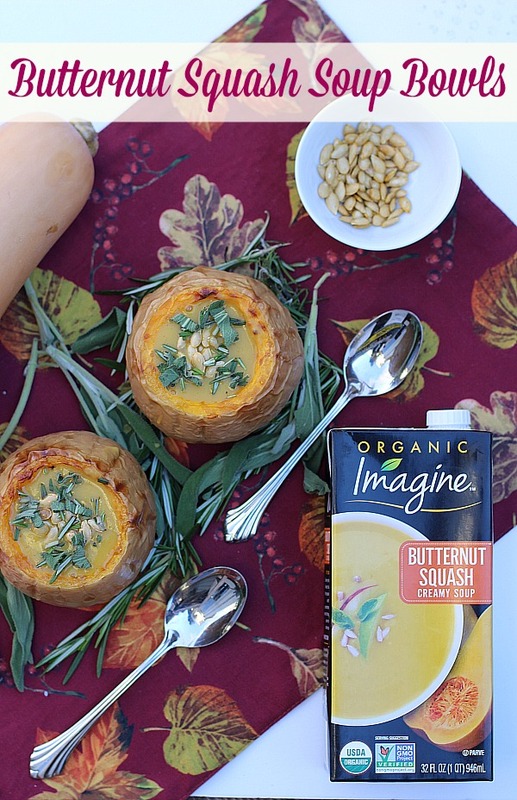 Then head to Walmart today to pick up Imagine® Butternut Squash Creamy Soup and serve it up in my butternut squash soup bowls. Or, if you feel like coming up with your own creation, pick up the Imagine® Tomato or Potato Leek soup and come up with your own fabulous way to serve it. No matter which variety you decide to serve, you really can’t go wrong when you start with Imagine® Soups from Walmart and add your own special touch. 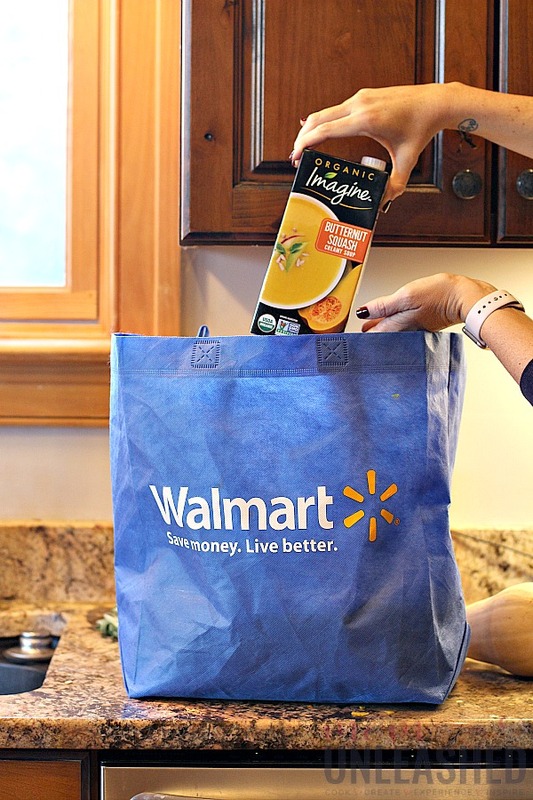 Now tell me, which of the Imagine® Soups from Walmart will you be serving up for dinner tonight? What a fun way to serve soup. I am going to have to make some of these for my family one of these days – they will love them. Make sure to really clean the outside and inside before serving anything inside to eat. Didn’t know you could just purchase soup ready to go. We always made it from scratch. Ooo I need to try soup like this for sure. How tasty. I’ve always love butternut squash. I love how these are prepared! I always enjoy trying new Soups I hadn’t tried before so I plan on making this this weekend and inviting my Sister over for lunch. I like the way that you’ve served the soup. It looks tasty and a great way to serve dinner. I will have to look for this soup at the store today. This looks like such a fun idea to make for my family. Love the presentation of this soup. We tried the Creamy Portobello Mushroom Soup and OMG! it was so good! Rich and creamy and seasoned to perfection. I plan to check out a few more flavors as the Imagine soups are pretty tasty and taste like homemade. 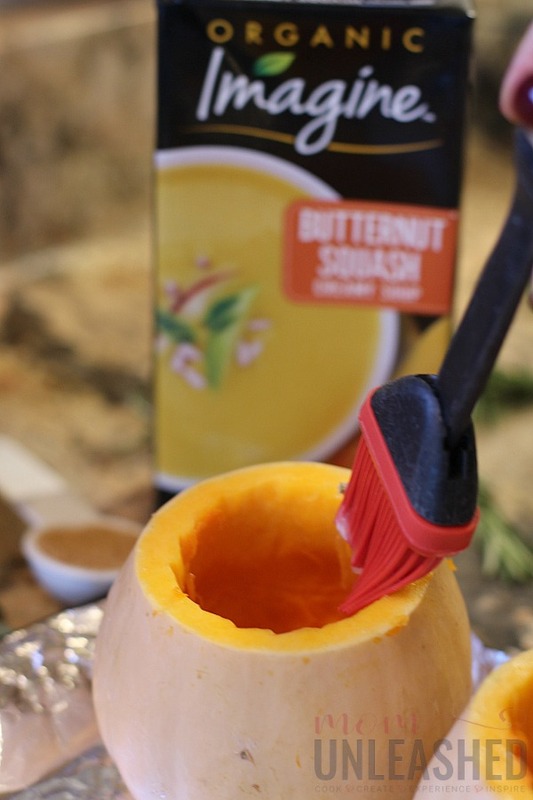 I love butternut squash soup and this is such a great way to serve it and have fun at the same time. The kids can also help with it. This looks so good and I love how simple it is thanks to Imagine soups. I need to try this out sometime. 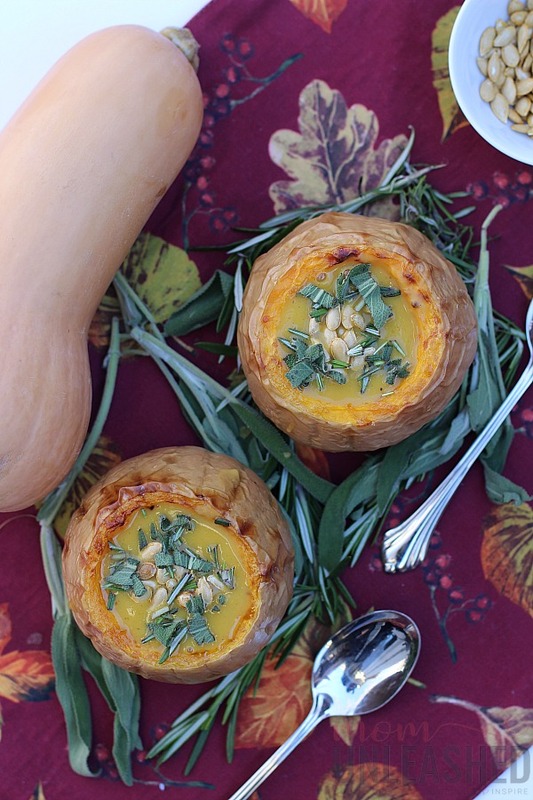 These butternut squash soup bowls look amazing. I haven’t really ever enjoyed squash before, so I’m always looking for new ways to try it. That is a cute way to serve soup! I find that a lot of ready made soups don’t taste as good as homemade, but your additions seem like an easy way to make them quite tasty. Yum! I’m such a soup person and butternut is one of my faves! It’s so creamy. This makes soup look so fancy. I would imagine the squash is so nice to scoop out with the soup. What a fancy idea! And I love how easy this is to make! So perfect for this cold weather season! I still have plenty of butternut squash here so thanks for sharing the recipe. I will try to make some this weekend. I just recently had butternut squash soup and it was delicious! I’ll try your recipe and serve it to my family in the cute little bowls. Thanks for sharing! What a beautiful presentation. I have tried that squash soup and it is so good! What a creative and fun presentation. Perfect pantry item, I’ll have to pick up a couple of cartons. 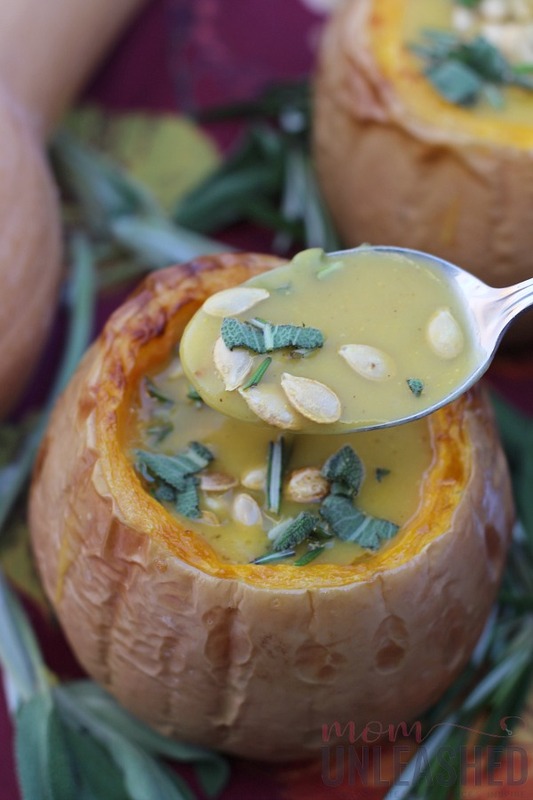 This butternut squash soup bowl looks delicious, great dish for cold winter days. I am going to give it try as we are butternut squash fans.